Casa Valdez Studios: The Joe Allard Saxophone Method Unveiled! Once in a while I browse the threads on the SOTW forum and occasionally find something really useful amongst the many sax nerd gear rants. A SOTW member named Gary Jones posted a highly detailed description of a practice routine that he learned from George Lowry, a student of master teacher Joe Allard. This post started a fascinating discourse on the micro-mechanics of saxophone playing- including oral tract, jaw and tongue position, mouthpiece exercises, and the function of vocal chords. As usual many of those who responded to the thread missed the entire point. Gary has done a noble thing by passing the Allard method along to the next generation of sax players. Thanks Gary! First thing is to do this exercise for a week with just a reed- no mouthpiece, no horn. Holding the end of the reed in your hand, place the reed on your lower lip like you are going to play it. Just let it rest there. Relax your mouth totally. No tension in you lip at all. Your lip is straight across and slightly turned over the top of your lower teeth. No downward tension on the reed, it just lays there. The only tension is the weight of the reed. Reeds aren't very heavy. Your lower lip goes right against your teeth with your lip as an uninvolved cushion between reed and teeth. Mouth sort of open like you have an invisible mouthpiece in there. Now practice blowing over the reed like that. Just like you are playing the reed on an invisible mouthpiece. You just use your lungs to push air but don't involve any of the muscles in your mouth or face. When you blow over the reed your lip and mouth don't respond in any way. The most important thing is that your lower lip doesn't respond by curving around the sides of the reed in any way. No clamping down on the mouthpiece, there isn't any mouthpiece there to clamp down on. Your bottom lip is completely relaxed like you are asleep. Practice blowing like that. This is what it should feel like to blow the saxophone. 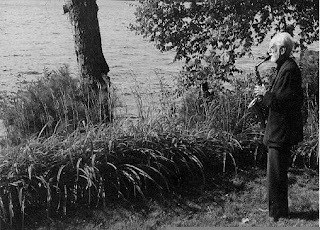 Keep a reed in you pocket and do it a lot. The other thing from the first lesson was breathing exercises. We were in an urban environment where we walked a lot but you could just as easily do this sitting down. When you are walking breath in through your nose for 5 steps. Hold your breath for 5 steps. Breathe out through your mouth for 5 steps. Eventually work your way up to 20 steps in, 20 steps hold, 20 steps out. Eventually you might like to do some empty counts after the exhale and before the next inhalation. As the air goes out you can restrict and control the flow like a flute embouchure. The exhalation is an even steady long tone. If you practice this while stationary just pace you’re breathing by counting like a walking pace. This is to develop good breathing but also for relaxation both mental and physical. You can't play music if your head is full of mental chatter. Later for added layers of concentration you can count repetitions. You could for instance do three groups of 12 different 20 count cycles or whatever like that. This would correspond to the multiple layers of concentration needed to keep track of complex jazz forms. One of the things we are trying to do is create the union of mind and body. You hear or think a sound and it comes out of the horn. Just like speaking. The breathing exercises are yoga exercises. Yoga means union. Eventually the head-space the breathing exercise puts you in starts to become a mental state you learn and can use when you play. In keeping with this theme there was a Hatha Yoga pose to practice that first lesson. Much to my surprise I was instructed to get on my back on the floor in the practice studio and do the Sivananda Yoga posture Setubandasana "the bridge" or "bridge-building pose" (bridge the gap between body and mind). It's basically about opening up and stretching your lower abdomen. Concentrate on how you are breathing when you do this. Learn to breath in deeply by drawing your diaphragm down. Only at the end of your inhalation is there a need to expand the chest. It's important to do the exercises but also to understand the reason why you are doing them. At the end of this lesson George told me to get the book 'Top Tones for Saxophone' by Sigurd Rasher and to get a single bevel reed knife. So now that we have the proper embouchure it's time to put the reed on a mouthpiece. First we have to prepare the reed. This is going to be hard to describe so I made pictures and you should ask questions. The purpose of this is to get the reed to seal properly. Soak a new re ed in a glass or bowl of fresh water for 15 minutes and then lay it out on a mantle or table somewhere upside down to dry. After it dries lay it upside down on your left index finger. It might help to wet your finger so the reed will stick. Hold the reed knife in your right hand and put it on the reed near the bottom. Put your left thumb behind the knife blade for support. With a counter clockwise twist of you right wrist and with you thumb for guidance and support for the blade, work the table of the reed until it is flat. Your thumb and index finger work together to control the pressure on the reed. You have to keep the knife pressure even left to right and the motion is scraping not cutting. 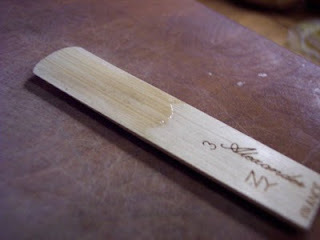 You want to fla tten about the first two inches of the reed (tenor reed). The most important part is about half way up where the mouthpiece table ends and the mouthpiece window begins. You want the whole area of the reed on the mouthpiece table to be flat and not warped or curved. You know the reed is flat when the material comes off the reed evenly all the way across. Material will come off only the high points at first. After you get the reed flat get a clean piece of high quality paper and put it on a perfectly clean flat hard surface. Place the reed on the paper flat side down. Put the tips of your first 3 fingers along the center back of the reed. 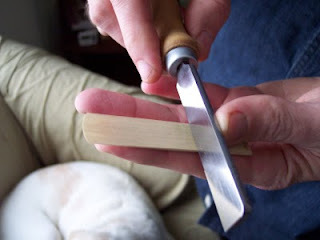 Rub the reed counter clockwise in a circle 100 times to polish and seal the flat side of the reed. Now rub you finger or thumb along the top, cut side of the reed from the vamp to the tip to seal the top. Rub allot like 100 times. You are trying to seal off all the open pores on the t op. This will seal the reed and make it into a solid object. A freshly cut piece of cane like all plant stems is a series of tubes. These tubes conduct air and water so an unsealed reed can't seal on the mouthpiece properly. At the end of your playing session you can check the seal on the flat side of the reed. Take the reed off of the mouthpiece carefully and look at the reed and mouthpiece. The reed should have a sharp line where the area above the mouthpiece window is wet and the fibers might be swollen. Below that, the area of the reed on the mouthpiece table should be perfectly dry. The table of the mouthpiece should be perfectly dry. If you want yo u can also shape the tip of the reed to fit the mouthpiece tip exactly. This will help the seal as the reed vibrates. Line the reed up to the tip but below it so you can see what it needs. 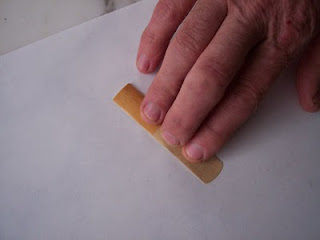 Take the reed off the mouthpiece and hold a piece of very fine wet or dry sandpaper in your left hand. You can get a little stiffness out of the sand paper if you need to by making a little bit of a curve with it as you hold it in the air. Don’t put the sandpaper against something just hold it out in the air. 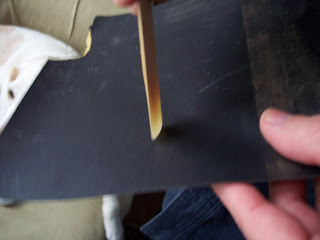 Now rub the tip of the reed against the sandpaper side to side (in a line edge to edge). Don’t put any stress on the reed tip. Shape the reed tip to match the mouthpiece tip. When you put the reed on the mouthpiece line it up so a little sliver of the mouthpiece tip rail is showing above the reed. In the actual lessons we started with Vandoren #5 reeds and cut them down to proper strength but that's too extensive to describe here and I was never good enough at it to fully understand what was going on. OK, now that we have a reed on the mouthpiece lets play. For this week play only the mouthpiece without the horn. Before you put the mouthpiece in your mouth, close your mouth and relax as much as possible. Feel how your tongue is against the roof of your mouth and the sides of your tongue are against your upper teeth. Now open your mouth a little and let your tongue fall down so it cuts your mouth cavity in half. Spread your tongue out so it covers your upper teeth on both sides at least partly and seals against you teeth. This does not apply to the front teeth, the tip of your tongue pulls back a little and will direct the air in between the reed and mouthpiece tip. Also your tongue is positioned perfectly for tonguing. Hold your hand up to your mouth and blow against it to feel how the air travels above your tongue. The air travels faster because you have reduced your mouth volume by half. Don’t put tension in you tongue when you do this. You can do it and still be perfectly relaxed. Now put the mouthpiece in your mouth and remember the feel from the first week of playing with only the reed. The upper teeth rest directly on the mouthpiece without any biting or pressure. When you play air should be leaking out of the corners of you mouth because your lower lip is straight across and not curving up the sides of the reed. Eventually some of your upper lip might come down and fill the gap and stop the leaking but the leaking is not a concern. Use the leaking as a sign you are doing it correctly. The reason why this is a good thing is if your lip touches the side of the reed it would kill the free vibrations of the reed. Your lower lip acts only as a fulcrum point for the reed to vibrate from. Your lip shouldn't dampen the reeds free vibrations in any way. OK, now here is the real good stuff. Practice singing a note or an interval or series of notes. Think about how you body automatically adjusts itself to make the different notes when you are singing. This is the same mechanism you are going to use to play the different notes on the mouthpiece. Never change your mouth position in any way and keep your mouth perfectly relaxed and use the way you sing with you vocal cords to practice on the mouthpiece. Play scales, play songs, whatever. What you need to do is imagine each note fully before you play it. Take the mouthpiece out of you mouth and sing what you want to play. Then imagine the same sounds as they are going to come out of the mouthpiece reed combination. Then play what you imagined on the mouthpiece. When you are playing one note and you want to change to another note develop a mental image of the new note before you try to play it. The mental image should include pitch, tone, and volume. Imagination is the mechanism for doing this. If you doubt your embouchure, play for a minute out of the extreme side of your mouth to get a feel for it. The side of your mouth doesn't have the muscles to get in the way. The tone you get from playing in the center should be the same tone you get playing out of the side. Now you get to play the horn. Stand up straight and imagine that you are hanging from a string that is attached to the top of your head and to the ceiling. Then use the neck strap to bring the horn to your mouth. Find just the proper adjustment for the neck strap. You will be surprised how much proper posture effects tone, just like when you are talking. Don’t hold your head too high or too low. Image you are relaxed and speaking to someone in a direct and honest way. That’s how it should feel when you play, like you are standing and talking. Now when you put your hands on the horn curve your fingers and put the tips of you fingers directly on the pearls. Don’t hold your fingers flat like you see so many players do. The tips of your fingers should never lift off of the keys accept when you need to use side keys or whatever. To get a feel for this and train yourself about the way it feels you can put a little piece of double sided tape on the pearls so your fingers stick to the keys. Think about the amount of energy that goes into pushing down the keys. Never squeeze hard on the keys only push them closed only with the smallest amount of energy needed to overcome the springs and make the key go down. Sing a note and squeeze something or push hard on a flat surface with just one finger and you can hear the tone of your voice change. Never lift your fingers, you never have to actively lift your fingers just withdraw the energy used to overcome the spring and let the key springs raise you fingers up as the keys open by themselves, get a feel for this because it's a very powerful concept. You don't lift your fingers you just stop pushing down and the springs raise your fingers for you. Now on to the book 'Top Tones for Saxophone' by Sigurd Rascher: The main goal of this book is tone and intonation development, the secondary goal is extended range into the 3rd and even 4th octave of the horn. You have to work on these exercises some every day and the progress will most likely be rather slow at first. The first sets of exercises on pg. 6 are long tone exercises. They are all important and well documented in the book. Outside of the instructions was the lesson to do the long tones soft to loud to soft. This is the most important for developing intonation. You should do this some each day. When you get to the loud part in the middle of the long tone really let the tone open up and get huge but not blasting. The main idea here is pitch. You might want to use a tuner. As you crescendo and decrescendo the pitch needs to stay perfectly steady. Skip the exercises on pg.7 about uniformity of tone, because we don't agree with the use of pressure on the reed as presented in the exercise. Then the page 8 and 9 exercises on tone imagination and ear training are very important and should be done some each day. For instance you can do one line on page 9 very carefully each day and the next day start on the next line in a continual rotation. Now comes the all-important overtone exercises pg. 12-18. Again just take a section each day to work on. When you do the overtone exercises it is very important not to adjust your embouchure in any way. You play the overtone exercises perfectly smooth with no breaks between notes and no articulation and no adjustments to your jaw or lips. If you use cheats like tonguing or embouchure movement then you are defeating the purpose. The point is to develop the vocal way of controlling the tones like you practiced on the mouthpiece. Don’t worry about how these turn out at first just try honestly to do them and let it go. The end result will be you can easily present the overtone within the tone of the low note and then take away the lower tone and isolate the overtone smoothly just like you are singing. It will also be possible in the end to do the exercises as multiphonics simply adding the higher notes to the lower ones and keeping the lower notes going or taking away the lower notes, as you like. The purpose in doing this is to be able to control tone color like you can with your voice. Tone color on the saxophone is a matter of adding or bringing out certain partials in the sound and lowering or decreasing others at will. Eventually this will be accomplished by simply imagining the tone you are going for. It's important to never play a note on the saxophone without first imagining the note in every aspect, tone, pitches and volume first. It is this very act of imagining the note that will bring your body on board with the mechanisms to produce the tone. Eventually this will lead to the mind body connection we talked about earlier where you simply have to imagine music and your body will automatically create the music for you without you having to think about it. The saxophone will eventually become just an extension of your body and therefore an extension of you mind. Just like the long tones the instruction, different from the book, was to also do the long tones with all manner of crescendos and decrescendos. You w ill find over time it is easier for instance to crescendo into a downward overtone movement and decrescendo into an upward overtone interval. You should also practice doing the opposite changing notes downward and the very softest point in a decrescendo and changing notes upward and the very apex of a crescendo. These crescendo decrescendo exercises added to the overtone exercises will really help turbo-charge the chop building aspect of the overtone exercises. One more point is that the overtone exercises in the book only use the low note fingerings because all notes on the saxophone are extensions of these few lower fingerings. There is never any need to do overtones on higher fingerings. It would be possible to play any music using only the few low note fingerings, say up to about D. It might even be a fun exercise to try to play some music using overtones and only the low note fingerings. I think that's about it. 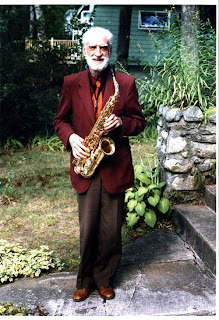 If you follow this basic style you should consider yourself a Joe Allard school saxophone player. To start to get the feeling of a "loose larynx", play a C major scale "backwards", in other words, start on middle C, but HOLD DOWN THE OCTAVE KEY & try to play a descending C scale in the lower octave whilst holding down the octave key. Don't worry about tone; just see if you can make the pitches, it’s going to sound like crap. See how far you can go. See how far you can go after doing it a week...a month..
Then play the ascending C scale, from middle C to high C, with the octave key OFF. That exercise will help you understand the feeling you need in your larynx to accomplish the other stuff. DO THIS STUFF SLOW!! Really slow. The point is to really feel it & listen & judge, not to race through it, like, "OK, I did my Allard stuff, now time to play licks". If you only worked on one exercise a week, but really did it carefully & slow, you'll really see the benefits. It’s a slow process. Here's a video made by SOTW member Dan Perez illustrating exercises using only the saxophone mouthpiece. Dan learned these from his teacher Scott Grimaldi. Thats great stuff Dave, I found after having to do Pilates exercises for my back that also involved 'the bridge' exercise, I made better use of my lungs. After correcting my embrochure as well, I was able to play harder reeds and make a better, thicker sound across the range of the horn. I find now that I make less excuses revolving around my horn and reed and look for the faults in myself. Its a constant life's work in progress. Its great to see this method put down in as such a detailed approach. Awesome! I also came across this, but in an early phase, with less information, and all scrambled. I've lost it, but I also had a printed interview with Joe Allard somewhere here, and in it he recounted tales of his own studies as a young boy and the evolution of his method. Wish I could find it again as it was all largely over my head when I first read it, and all I remember now are the photos (some of which you've printed here) and the story of arriving at his lesson to find his clarinet idol in the shop and his teacher absent, asking his idol for a lesson; having forgot his clarinet at home, he recounts his horror at the lack of hygiene of his idol's horn (don't remember the player's name) yet being the dutiful student eager to learn, he put his disgust aside and played on rather than miss this opportunity. I think the story you're referring to was from the Joe Allard Project web site. I put a link to it at the bottom of the post. doh-- yes, so it is. that's it exactly! thanks! I found my way here while looking for info about my old teacher from VCU circa 1977-9, George Lowry. Sad to hear George has passed. Gary did a beautiful job summarizing his teaching, much better than I could have. George was doing graduate study at Juilliard and commuting to Richmond every week by train. It was like he was bringing fresh wisdom straight from Joe every week. The first text he assigned was Zen in the Art of Archery. I put down the horn for many years and have recently returned to it. I'm surprised to find I have nice control over tone production, due in large part to the solid foundation I received from George Lowry. I remember Gary. Tall, soulful tenor player. Once I heard him remonstrate with another musician about playing bad music as a kind of spiritual crime. The idea being that vibrations keep radiating out to infinity, and bad music sort of pollutes the universe. Can't say he's wrong about this. I was very much impressed with his sincerity. Gary, if you're out there — your name is impossible to google. Reply to this thread or find me (mikejolk) on Saxontheweb. 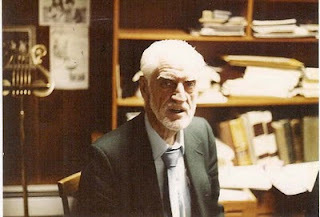 Any other students or colleagues of George ... It would be good to hear from you.